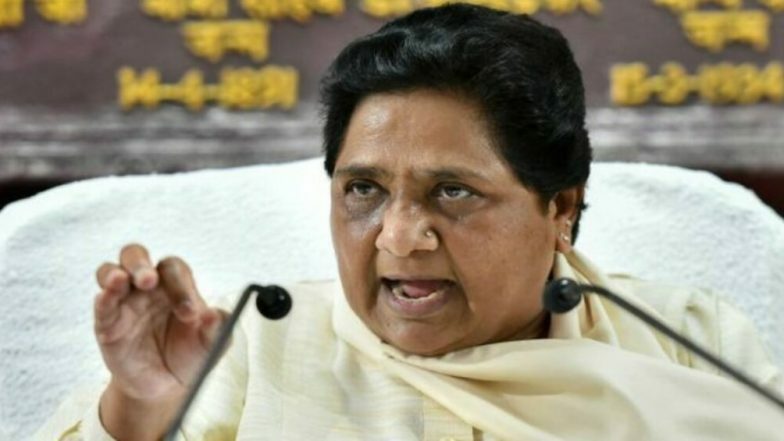 Lucknow, April 13: Bahujan Samaj Party president Mayawati regretted on Saturday that an attempt was being made to create hatred between the followers of Bajrangbali and Ali. In a tweet on the occasion of Ram Navami, Mayawati said: "Greetings & good wishes to the people for peaceful & prosperous life on Ram Navami. When people are happily remembering the ideals of Shri Ram, it is unfortunate that an attempt is being made to create confrontation & hatred between Bajrang Bali & Ali for narrow political gain." Mayawati's comments come after Uttar Pradesh Chief Minister Yogi Adityanath had on Tuesday compared the Lok Sabha election to a contest between 'Ali', a revered figure in Islam, and Bajrangbali, the Hindu god Hanuman. Adityanath, Mayawati Respond to EC Notice on Model Code Violation. "On the centenary of the Jallianwala tragedy, our homage to martyrs & sympathy to the family members who sacrificed their lives for the country. It would have been most gratifying had the Indian govt. succeeded in extracting an apology from the British for this gruesome massacre," she said. Mayawati Appeal Muslims For Vote.